NEF2ACR is a Microsoft Windows executable. Use with right‑click and Open With on a NEF file in Windows Explorer. Initial use will require using �Choose Program�� and browsing to the NEF2ACR executable. Create a folder on your computer to hold NEF2ACR.exe and associated files. Ideally this folder will be on the same drive letter as your NEF files as this speeds up processing. On my system this is �D:\NEF2ACR�. Download the program into the folder by using right‑click and �Save Target As�� on this link: NEF2ACR. These instructions may vary slightly depending on your internet browser. 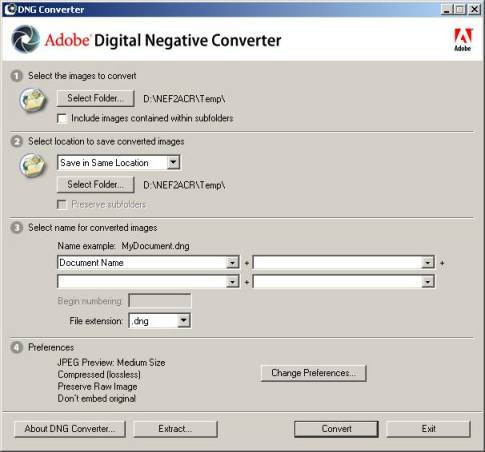 Download and place Adobe DNG Converter.exe from the Adobe web site into the same folder. You want at least version 4.3.1. It is bundled with ACR 4.3.1 that you will discard. Depending on your version of Photoshop you probably want ACR version 3.7. Create a subdirectory named �Temp�. Source folder to point to the Temp folder as created above. Destination folder as �Save in Same Location�. When NEF2ACR is running a small status window will appear. Delete all files in the Temp directory and copy the NEF file there. Invoke DNG Converter (located in the same folder as NEF2ACR). Push the Convert button for you. Push the Exit button for you. Delete the NEF file from the Temp directory. Move the DNG file from the Temp directory to the directory from which the NEF file originated. Invoke Photoshop (located via the Windows registry) which will bring up Adobe Camera Raw (ACR). And then NEF2ACR and the status window will disappear. NEF2ACR assumes that DNG Converter is configured as outlined. If you use DNG Converter manually then be certain to reconfigure afterwards for NEF2ACR useage. I wrote this for my own use and I�m happy to share it with others. Feel free to let me know about your experiences with NEF2ACR.